Most people are shocked to learn that Health Canada still allows the use of strychnine, sodium cyanide, and Compound 1080 to kill predators such as wolves. Nothing could have prepared Cristina Blackmore for what was to happen that summer afternoon. Her beloved border collie, Dulce, was busy chasing ground squirrels in the horse corral next to their house. Suddenly Dulce ran to her and dropped to the ground, writhing in massive convulsions. The veterinarian arrived 15 minutes later but nothing could be done: Dulce died in Christina's arms as her grandchildren looked on in tears. Post-mortem examination confirmed that Dulce was a victim of strychnine poisoning. Tragedies like this one happen every summer in Canada, as pets accidentally ingest poisons that are legally set out in baits intended for wolves and coyotes. Most people are shocked to learn that Health Canada still allows the use of strychnine, sodium cyanide, and Compound 1080 to kill predators such as wolves — an archaic, inhumane, and unnecessary practice that poses a deadly threat to wildlife, pets and children. Strychnine is a deadly neurotoxin made famous in film and literature, featuring prominently in several of Agatha Christie's murder mysteries, and more recently identified as the likely culprit for King Joffrey's death in Game of Thrones. It is best known for its gruesome method of death, producing some of the most dramatic and painful symptoms of any known toxic reaction. When inhaled, swallowed, or absorbed by the nose and mouth, it causes extremely painful muscular convulsions, ending in asphyxiation. Strychnine is used in Alberta as part of its wolf kill program, and in Saskatchewan to kill gophers, ground squirrels and other small animals. There is growing scientific evidence that killing predators such as wolves and coyotes does not reduce predation on livestock. Sodium cyanide is another poison used in Alberta to kill wolves and coyotes. It causes violent and painful convulsions, severe anxiety, and loss of bodily control as it attacks the heart, circulatory system and central nervous system. 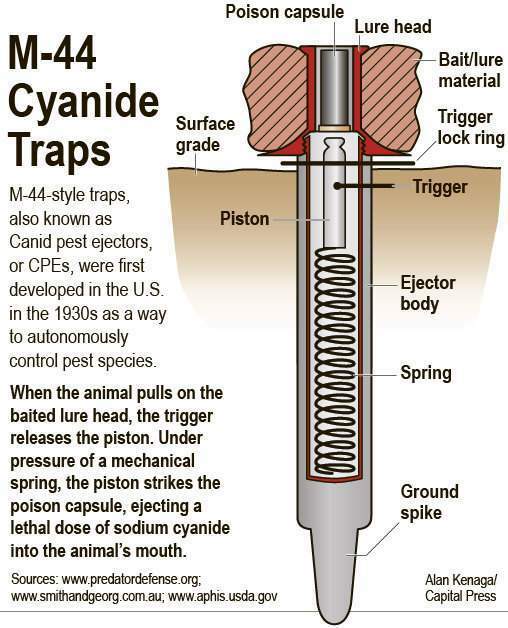 This poison is most often used in a device called an M-44, also known as a "cyanide bomb". Sodium cyanide is extremely poisonous and can kill all warm-blooded animals - including humans - if swallowed, inhaled or absorbed through the skin. The use of sodium cyanide recently gained international attention this spring when one of the devices exploded on a 14-year-old boy walking his dog in Pocatella, Idaho, resulting in the tragic death of a Labrador retriever and hospitalizing his young owner. Between 2000 and 2012, M-44 devices killed more than 1,100 dogs in the U.S. There is currently a Petition to the U.S. Environmental Protection Agency, and a bill before the U.S. House of Representatives to ban M-44 sodium cyanide devices in the United States. Compound 1080 — sodium monofluoracetate — may not have the widespread recognition of the two previous poisons, but it is just as deadly. It has no antidote, and is toxic to mammals, birds, fish and invertebrates, creating a high risk of residual poisoning for scavengers and many other species. Compound 1080 is currently authorized for use in Alberta and Saskatchewan to kill wolves and coyotes. The poison is placed in meat baits set out to lure in predators, or placed in collars worn by livestock such as sheep. Manitoba and B.C. have discontinued the use of Compound 1080. Canyon Mansfield and his Labrador retriever. The dog died and Mansfield was sickened after they checked out a cyanide trap meant for predators in Idaho in April. These poisons are acknowledged as an inhumane method of killing animals due to the intensity and duration of suffering caused. Victims suffer an excruciating and painful death, which can last several hours or even days. The use of strychnine to kill wolves is in contravention of the animal welfare standards set by the Canadian Veterinary Medical Association, the Canadian Council on Animal Care guidelines, the American Veterinary Medical Association, and the American Society of Mammalogists, and its use does not meet the International Union for the Conservation of Nature (IUCN) guidelines for wolf management. Although these poisons are intended to target wild predators, their indiscriminate nature also results in the death of non-target species. A review of Alberta's wolf reduction program in the Little Smoky woodland caribou range between 2005 and 2012 reported 154 wolves killed by poison, and 180 "non-target" animals including lynx, coyote, fox, ravens, fishers and martens. Carcasses containing Compound 1080 and strychnine can be toxic to scavengers, causing secondary poisoning through the food chain. Pesticides represent over 30 per cent of the accidental poisonings identified in livestock, companion animals, and wildlife in western Canada since 1998. Pets and livestock are also at risk. Pesticides represent over 30 per cent of the accidental poisonings identified in livestock, companion animals, and wildlife in western Canada since 1998, with at least 93 cases of strychnine poisoning in dogs in Saskatchewan, Alberta, and Manitoba during this period. A 10-year study of sudden death in dogs described toxicity as the second leading cause of death following heart disease, with strychnine accounting for 96 per cent of these cases. An Alberta Department of Agriculture and Forestry web page on prairie dog control admits that "many dogs like the commercially-prepared [strychnine] bait and will consume a lethal amount if allowed to do so." Further, there is growing scientific evidence that killing predators such as wolves and coyotes does not reduce predation on livestock, and that non-lethal alternatives can be far more effective in reducing and preventing conflict with predators. It is time to end the cruel, unethical, and unnecessary poisoning of predators and pets in Canada. Alberta's five-year use permit for strychnine expires Dec. 31, and Health Canada is currently re-evaluating certain uses, with consultation and a proposed decision scheduled for early 2018. Help us to make Canada poison-free for wolves and other wildlife. Please take action today and ask the minister of health to bring an end to the use of these poisons.